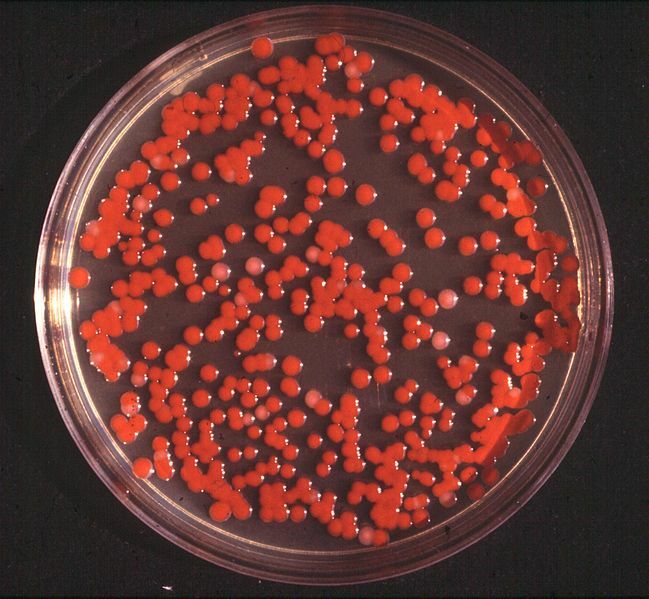 Culture of Serratia marcescens, copyright Brudersohn. Serratia is a genus of rod-shaped, facultatively anaerobic bacteria, some species of which produce the red pigment prodigiosin (Ajithkumar et al. 2003). [AA03] Ajithkumar, B., V. P. Ajithkumar, R. Iriye, Y. Doi & T. Sakai. 2003. Spore-forming Serratia marcescens subsp. sakuensis subsp. nov., isolated from a domestic wastewater treatment tank. International Journal of Systematic and Evolutionary Microbiology 53: 253–258.